The caryophyllids are a large group of eudicot flowering plants -- in fact they include more than 11,000 species, or about 7% of all flowering plants. Most of these species belong to one of three caryophyllid families: Aizoaceae (ice plants), Cactaceae (cacti), or Caryophyllaceae (carnations). Several representative caryophyllids are pictured above. 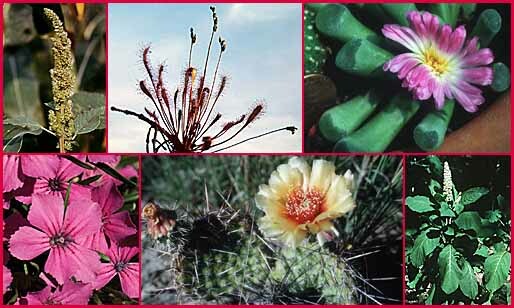 Clockwise from top left, they are: Amaranthus retroflexius (a relative of quinoa); Drosera anglica (sundew); Lithops (a "stone plant"); Phytolacca (pokeweed); Opuntia (a cactus); and Dianthus glacialis (a member of the carnation family). Most caryophyllids share a number of unusual characteristics in their pigmentation and their morphology. They contain betalain compounds, a group of redddish and yellow pigments that are not found in any other plants. If you have ever heard the expression "beet red", then you are aware of the strikingly red color that red betalains can create, since beets are members of this group. Click on the buttons below to find out more about the Caryophyllids. Read more about the Caryophyllidae from Botany Online (currently only available in German). Bone up with lecture notes on caryophyllid classification from James L. Reveal from the University of Maryland, or lecture notes from Hugh D. Wilson at Texas A & M.
Find out which caryophyllids have appeared on postage stamps. Caryophyllid collage created using images provided courtesy of the Virtual Foliage.